As our world gets smaller and competition cuts deeper, how can companies survive? More precisely, how can they compete for scarce resources? I finished reading The Collaboration Economy: How To Meet Business, Social, and Environmental Needs and Gain Competitive Advantage, by Eric Lowitt. It’s a book for leaders young and old about how to enable the world to achieve a state of sustainable development. It’s the kind of book that makes you think. With the ideas in this book, you can take you or your company to new places. Better yet, you can change the world, or at least, YOUR world. Eric Lowitt is a strategy and sustainability advisor to CEOs and corporations worldwide. He is the best selling author of The Future of Value, and he writes regular columns for The Guardian and HBR.org. So rather than compete for the non-renewable resources, companies can collaborate and innovate to find sustainable solutions for the long-haul. In this new economic paradigm, private, public, and civil sectors collaborate to strengthen the global systems we rely on daily for survival, including water, food, and energy. Sustainability is the new advantage. Visionary CEOs are embracing sustainability, not because it’s politically correct, but because their businesses depend on it for revenue, innovation, and competitive differentiation. Chapter 10 – Where Do We Go from Here? Actionable. At the end of every chapter, Lowitt includes a “Call to Action.” It’s easy for a topic like this to turn to pie in the sky, but Lowitt has his head in the clouds and his feet on the ground. As such, he effectively bridges big picture thinking with pragmatic action. Case studies. 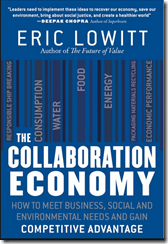 To make this real, Lowitt includes case studies from the leaders of the Collaboration Economy including Unilever, Coca-Cola, GE, Nestle Waters North America, Grieg Green, and the European Parliament. Data and statistics. Throughout the book there is interesting data and useful statistics to help put some thing sin perspective. Framework. It’s more than a book. It’s mental models and a conceptual framework to help you launch a sustainability coalition. Real-world experience. Because Lowitt lives and breathes this domain, he has real-world experience that he shares throughout the book. Collaboration takes time, but it’s a strategy tool to win for the long run. What Does a Collaboration Economy Look Like? If we work backwards from the end in mind, is it worth it? What does a Collaboration Economy actually look like? In a Collaboration Economy, it won’t be OK to create value, while leaving a trail of waste behind you. Companies will find ways to turn waste into resources, and they’ll solve shared problems in cooperative ways. “As companies internalize their external costs, two things will happen. First, the global economy will shift from an economic model in which waste is waste and in which zero-sum game competition is the norm, to the Collaboration Economy, where business and social dimensions are combining both to place a recognized and fungible value on waste in all its forms and, ultimate, to change what is considered by stakeholders to be acceptable value creation by companies. Focus on What Matters Most. Identity at least one natural resource without which it cannot survive — food to a foods company, water to a beverage company, energy to an energy services company, and the like. Develop and Nurture Relationships. Build a reliable portfolio of partners. Organize Your Coalition. Create two coalitions, one to work globally, and the other to act locally. Commit to Precise Coalition Goals. Each member of the coalition must commit to precise goals, and your company, acting as the orchestrator must commit to operate transparently. Execute Through Your Coalition. Assign specific tasks to specific coalition members to accomplish your goals. Renew Your Coalition’s Plans. Document and share lessons learned as you complete projects, and bake a commitment to learning into your coalition’s governing principles. If you pick a goal that matters to the people involved, it’s easier to rally them around it. How do you move beyond zero-sum competition? You solve the global pursuit of sustainability. The second reason zero sum is the enemy of sustainability is that it reduces the sharing of best practices among competitors. If one competitor, focused on lowering costs, found a way to do so, what incentive does it have to share this new way with its competitors? Some will argue that this lack of sharing among competitors fuels innovation, ultimately leading to lower prices; in turn, this innovation produces a stream of new products, often making products sold last year obsolete. But where these unwanted products land? All too often, they are throw into landfills. Where’s the innovation in that? Engage in cross-sector collaboration on natural resources. Compete when getting goods on and off the shelf. Collaborate again to get materials back into the manufacturing cycle. Compete for these materials once they are reprocessed. If you have the right collaborative partnerships, you have a competitive advantage. Similarly, if you lack collaborative partnerships where it counts, you’ll be at a disadvantage. What Makes the Difference Between Visionary Strategy and Realized Growth and Prosperity? It all comes down to how a company changes their operations. The way we frame things changes how we see things. If you want cultural change, change the frame. It takes a lot of work. It takes a lot of people. If you expect that going in, then it’s a great reminder that you’re really doing stakeholder management at a grand scale. If you really want to create a sustainable system, then you need to bring together business, government, and civil society around a common goal. The best people want to make a dent in the world. They want to change the world and they want to leave it a better place than they found it. Non-profits can spin up for-profit entities that help them both self-fund their activities, as well as deliver more value to those they serve. Businesses can re-imagine their organizational structures to create innovative, collaborative hybrids from government, profit, and nonprofit entities. Would an Environmental P&L be a viable addition to a business? Can you combine business and social dimensions for financial success. Some companies are testing that the Peleton way. As I read the book, I couldn’t help but remember a comment by Bill Gates long ago. Bill Gates made the statement that the market doesn’t always do the right thing. Now I wonder, what if it did, or at least tried to, or made some significant steps in a more meaningful and collaborative direction? I want to point out that the book is not an easy read, but it’s a thoughtful read. The stories and real-world examples help bring the information to life. Mostly, it’s the kind of book that gives you both a jump start into a complicated topic, as well as practical advice and guidance. The big upside here is that this book is a peek into the future. You get to see what some big companies are already doing to make a Collaboration Economy a reality.